The motive is to make quick migration and in this regard, software developers ensure for providing bulk data migration. This is the handy feature which creates ease in the long run. With batch migration, users can save their long hours spend in email conversion. By using this application, you hardly face Windows OST edition issues. Thus, buying of the software is like a blessing because even user using any Windows edition can run the application with complete ease. 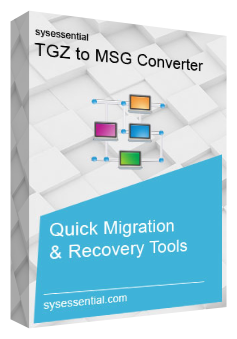 If you are a non-technical user and want to migrate emails from Zimbra into MSG then pursue Sysessential for TGZ to MSG Converter and perform immediate migration without any botheration. The Interface is simple and undoubtedly easy to understand even when user is not technical at all. Explain all about free demonstration run of the software? The freeware demonstration edition offers an excellent way to access the working of the software very closely. Choose this edition by clicking Download Now and free demo will start migrating first 10 emails of every item from Zimbra TGZ emails into MSG file format. The freeware edition will clear everything. The demo will also let you know about features of the tool, thus download the application and catch apt info about tool in advance. Is software supportive of all Windows editions or few selected editions? Will software perform swift data migration even when data is in bulk? The application is a powerful source for migrating bulk data from TGZ emails into MSG file format. Just install the application and enjoy smooth migration. You can select the emails prior migration which will move only those emails which you wish to move. If you are in some troubles or have some queries to be sorted out then give an immediate phone call at the Customer care team. Just calling at the helpline number, customer care executives will answer every query that you ask from them. This way, you may involve into direct chat with the professionals and will be able to catch correct answers for every question that you have. Even if you feel like catching direct software developer support then team will initiate you this but only when you are in severe technical troubles otherwise not. Where to collect complete purchase info of the software? If you have prepared your mind in making purchase of the software then ensure that you have purchased the application in fully operable mode. In this regard, you are recommended for contacting support executives and seek the process to but the application in full working mode. In what aspects software is beneficial for non-technical guy? The application is completely effective for technical guys as well as non-techie guys. Even advanced technologies will not restrict you from executing email migration from TGZ to MSG file format. Thus, get into contact with the support team through recommended contact number and find the best ways to invest in the tool. We run an organization. Everything was happening in the fine state. Suddenly, an idea broke out where we decided to keep back up of Zimbra TGZ emails into MSG file format. Actually emails were many and manual method made us tired. To overcome undue efforts, time, and energy, we decided for using third-party software solution such as Sysessential for TGZ to MSG Converter which converted mailbox data into MSF file format with utter ease. The steps were so simple and understandable. It took few minutes in execution of TGZ into MSG conversion.